Frontman Anthony Raneri discusses Bayside’s new record Killing Time, waiting for the beauty in life to happen, never feeling like he’s truly arrived, and debates honesty versus celebrity in pop music. You did some 10th anniversary shows recently. What does it feel like to have been doing this for 10 years now? It’s weird, you know, because it doesn’t really feel that long. I think it’s pretty awesome, I guess. It’s a testament to what we’ve accomplished. A lot of people are pointing out how this is your first album on a different label and all that. I am curious about what the free agent process was like, what you were looking for in a new label and how you ended up choosing Wind-Up. The process was interesting. You know what I mean? It was what we expected. A lot of different labels calling and saying a lot of stuff, and really Wind-Up turned out to be exactly what we were looking for. It’s very music driven, very artist driven. I think everybody involved, every label – majors, indies, somewhere in between – everybody wants to win. I think Wind-Up was the label that after talking to really understood that music is where you win. You can spend all this time, and effort and money, advertising things and trying all these tricks. Wind-Up was the label who was like, “We understand. We’re going to give you time.” Wind-Up owns a studio, for instance. They were the one label that understood. “We’re going to give you time. We’re going to give you a studio. We’re going to give you whatever you need to make the best record you can make because that’s how we’re all going to win.” That was the main thing we were looking for, and that’s what we got. The big thing on this record was you were able to work with Gil Norton, who is one of my favorite producers of all time. How did you hook up with him, and then what was that experience like? On every record when we talk about producers, there’s the list of people who we would love to produce the record, and then the list of people who might actually do it. We demoed a ton on this record, which is something we’ve never done before. We rewrote and rewrote, and demoed and demoed everything until we felt like it was perfect. We sent demos out to a bunch of producers, Gil being one of them, but we didn’t even expect to hear back from Gil, let alone him getting back to us and actually being interested. So we sent the demos, and his management called our management. Our manager called me and was like, “Hey, Gil Norton wants to get on the phone with you,” which was hard to believe. Gil called me at home and we had a long conversation. It was amazing. He’s a genius. I can honestly say that he’s an actual genius of our time. I think he’s the best living rock producer there is. How long were you in the studio with him? It’s hard to say because the process was very long and stretched out. We were in studios here in the States while Gil was in England, where he lives. So we were working on songs, and we’d send him demos and he’d send back comments. We’d get on the phone and talk about the songs, and he’d give us his input on things. That went on for a while. That went on probably six months. We were actually in the studio together for two or three months. This record is certainly your most polished-sounding and really catchy, but it also rocks really well and has a lot of solos and stuff. Was that something that he brought out of you guys more? The thing with a real good producer that Gil just nailed, and what I always look for in a producer and Gil was perfect at it, is he figured out in a lot of conversations what we wanted to do. His job is really to make sure we pull it off. His job wasn’t really to have input into the vision. It was to make sure we were pulling off the vision that we wanted. It’s hard because it’s one thing to say we want it to sound like this. You know it. You’re a music journalist. You read bios all the time where people say that they sound like this, or they sound like that, or they sound nothing like that. You know what I mean? So it’s one thing to want to sound a certain way, and it’s another thing to actually pull it off. That’s really where a producer comes in and that’s where Gil really excels, making sure we were pulling off what we were trying to do. I know in the past your songwriting has initially started off acoustically, and then goes from there. Is that how it was like on this record as well? Oh yeah, 100 percent. I don’t even have an electric guitar in my house. That’s where I do all my writing. I write everything on acoustic, except there was one song on the record I wrote on a piano. Everything starts on acoustic, and then I take it to the rest of the band and we start sorting out where to take it from there. But it starts out with an acoustic chord progression, and melody and lyrics. I want to talk real quick about the cover, which I think is my favorite cover that you have done so far. What was your concept behind that image? When we came up with the title, Killing Time, which is kind of the theme we think is on the record – the way we look at Killing Time is not so much that we wanted to waste time, necessarily, but more like you’re waiting for something. You’re waiting, and you’re waiting, and you’re waiting. The title track on the record, the chorus lyric is, “I spent all my life waiting for a moment to come.” That’s where we are in our personal lives, and that’s definitely where we are as a band. This is a big, coming out record for us. We’ve done that waiting, and waiting for something great. That image of the astronaut hanging out – he’s going to be doing something great any day now. He’s going to be in space. He’s kind of a future hero, but he’s waiting for a call, though. He’s in a diner, reading a paper, waiting for the call. You mentioned the song “Killing Time,” and another one of its lines I really like is, “I’m halfway to happy now and I always mistake it for progress.” What does that mean to you? I guess that line in particular is you’re always waiting for something. People have asked us when we knew that the band was starting to do well. When we felt like we made it, you know. I always say I don’t feel like we have. I’ve had conversations with some close friends who are incredibly successful musicians, and they say the same thing. They don’t feel like they’ve arrived. The amount of work that it takes, physical work of actually putting in the work and then the mental effort to really accomplish something great, it doesn’t afford you the time to notice what you’ve already accomplished. To me, that line is I don’t ever want to feel like I’m finished. I’m waiting for this great moment. It’s OK to keep waiting for the great moment because you’re constantly creating new great moments. I think it’s wrong to ever say I’ve arrived or I’ve accomplished everything I wanted to accomplish. I want to talk a little bit about your lyrical process. You write a little about the music business, you write a lot about relationships and then you also write some philosophical type stuff. How do approach those and come up with those themes? Most of our records have a theme. On this record, more so than any other record, I’m writing from a very specific place, the whole waiting thing. You find this greater concept, which is constantly waiting for greatness or something incredible. Sometimes you get it, and you don’t know and it’s incredible, and sometimes you get it and it’s not what you thought it was. That can be great if it comes in the form of career success or greatness in life in general. Career or relationships, you’re waiting for the beauty in life to happen. That’s the general theme for me. Then for each song, that general idea takes the form of being in a band or takes the form of being in a relationship. When you first started writing this record did you already have that theme in mind, or was that something you discovered as you were writing? Yeah, I’m real big on concepts, constantly. There definitely was a lyrical concept of what I wanted to say through this record before I ever wrote any lyrics. Then even musically, before I write a song I come up with the kind of song I want to write, what I want it to do, where I want it to go, and then I write it. Another song I want to mention is “Seeing Sound,” which might be my favorite off the record. I really love the lyrics on that where you’re talking about being your own puppet and not following the heartbreak trend. Can you talk a little about how you came up with that song? It’s supposed to be tongue in cheek and sarcastic, very sarcastic. When I was writing it and when we were recording it, we were definitely keeping our fingers crossed, hoping it was coming off sarcastically. I didn’t really want anyone to think I was a puppet. You know what I mean? But, you know, bands don’t really use their voice to speak about who they are and where they are. I think it’s this juggling thing you have to deal with. You’re kind of giving people what they want, but at the same time sneaking in what you want. The heartbreak thing – again, sarcastic. Heartbreak is a trend, but I’ve never been that trendy, you know. I want to bring up something you said in the Alt Press podcast that I know a couple people online were confused about. You were talking about how you can’t really like punk music and Justin Bieber or Lady Gaga at the same time unless it’s in an ironic sense. Can you clarify a little bit more on where you were going with that? I think it spun a little. I think it came off a little differently than I might have meant it to be. Honestly, I listen to a ton of pop music. I’m a big advocate of the fact that a song is a song. It’s more of the mentality behind the two things. I listen to pop music because I appreciate the songwriting, and whoever’s singing it is totally secondary. I don’t even think about it. I like a lot of Miley Cyrus songs because I really like Max Martin’s songwriting. I could care less about Miley Cyrus. A song is a song, and I think that’s wonderful. For people to sign up for something completely honest, which is punk music, and the image and the lifestyle, and also subscribe to the celebrity, which comes with pop – it’s very conflicting things. I guess I don’t mean it in the sense that you can’t like a Justin Bieber song and a Bad Religion song. You can like both songs, but you can’t like Bad Religion and Justin Bieber because they’re conflicting ideas. So you’re talking more about the ideologies behind the two mindsets? Yeah, but more than that because music is just music. It’s faceless. It’s its own entity. To be a Justin Bieber fan – it’s this weird thing in our little corner of the music scene where people listen to things and dress in ways that our ironic. To me, people listen to Justin Bieber the same way they grow a mustache, because they don’t mean it. They don’t actually think that the mustache is cool. They’re doing it because it’s ironic. Or it was cool at some point in the past. But was it ever cool? It was never cool, you know. Doing it is so uncool that it’s funny. Again, a song is a song, whether Justin Bieber sings it or Bad Religion sings it. I do listen to a lot of pop music, but you can’t think Justin Bieber is cool and Bad Religion are cool because it’s two different sides of the war. You can’t think that both teams are going to win. You have to go with one, honesty or celebrity, because they’re not the same thing. You’ve done the Where’s the Band? Tour for a couple years now, so you’ve been getting a lot of questions about doing a solo record. Do you think you will ever put one of those out at some point? Yeah, definitely it’s something that I want to do. I have a lot of songs that I’ve written that don’t really work for Bayside that I’d definitely love to see the light of day. It’s so hard to get the time to do it. To do the shows is one thing, because I can find a week in my schedule to go on tour and play some shows. But to do a record, you’re committing to a year of your time, at least. It’s impossible to find the year to finish writing a record, record it, tour on the record and do the whole press thing on the record. 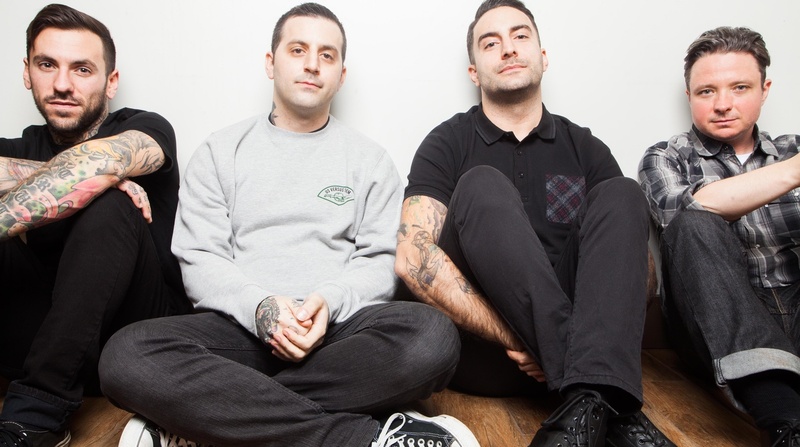 It would have to be a year off from Bayside, which really is not feasible. One last song I would like to ask about is “It’s Not a Bad Little War.” I love the chorus on that one where you’re saying, “If fate should fail us hope will see us through/ Stand for something because something’s over due.” How did you come up with those lines? I don’t know. I just came up with it. It’s hard to explain where something comes from. I think they’re pretty self-explanatory lines. The song is about music and being in my band, specifically. It’s a little more like a Bayside story. Honesty in music is so important to me and the music that I play. Stand for something, stand for anything, because I feel like there’s a real lack of anything. I guess I was trying to purposefully keep it anonymous. Stand for something because something’s over due. Whatever it is that you stand for, have a purpose. You’ve been talking about how bands are never content and how there’s always some next level you have to reach or maintain. With that said, what are your hopes and ambitions for Killing Time and the future of Bayside? We’ve actually already accomplished a ton with the record because I think it’s the best thing we’ve done. So we’ve already accomplished a lot just by making the record and writing those songs. We feel like we made the perfect Bayside record. I know it’s hard what to expect from the cycle that comes after the record. I mean, I don’t know. It’s not up to me, really. We’re going to keep playing shows and writing songs. Like I said, I don’t really allow myself the time to think about where we are right now, let alone where we’re going.